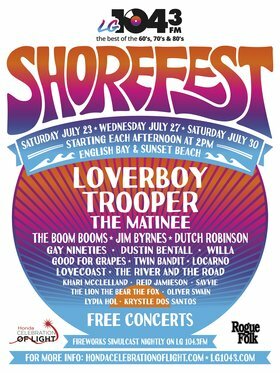 WHAT: 8th annual LG 104.3’s SHOREFEST at English Bay and Sunset Beach is the ultimate west-coast beach party - encompassing free live music and beach hopping. WHO: This year’s headliners include multi-platinum and 80’s iconic Canadian rock band, Loverboy, as well as Jim Byrnes & Friends, Matinee, Twin Bandit, and JUNO Award® winner Trooper. For the full lineup click here.